Topical steroids are creams, which can be used to cure the skin disorder vitiligo, but their continuous use has been known to lead to various side effects like tachyphylaxis, steroid rosacea, skin atrophy, stretch marks, alteration of infection, topical steroid allergies, and glaucoma. This is a common side effect, which is noticed in people who already have rosacea. It often occurs when steroids are used to cover the white patches in the face. Mild use also leads to these side effects. Due to the side effects experienced, people will go for some other strong steroid cream, which will result in some other side effect; as a result, people using it will stop it immediately, so the face is left with red patches as a result. Tachyphylaxis is where the skin is no longer responsive to the drug. It is a condition in which the skin reacts with vasoconstriction as a consequence of topical steroids. With repeated usage, the skin develops capillaries for which larger dosages will be required, and where more frequent applications of the steroid will be required. The side effects will be noticed after continuous use – that is, after 4 days – and once the treatment is stopped, the constricted blood vessels will then revert to normal after 4 days. Continuous use of topical steroids on areas where one part of the skin touches another, like the groin areas, will result in side effects like stretch marks. Once the stretch marks appear, they can no longer be eliminated as they are largely permanent, and the stretch marks will be very itchy. In order to get relieved from the feeling of itchiness, a lower-potency steroid would be used. It is thus better to reduce the use of topical steroid creams. Continuous use of topical steroids on the same area will lead to the thinning of the epidermis. Due to this, the skin will become shiny, wrinkled, and dry. 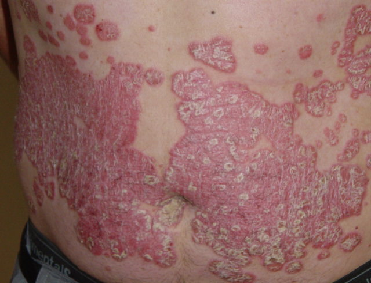 This condition is reversible in most cases if the use of topical steroids is stopped. There are people who are severely allergic to the use of topical steroid creams. In such cases, topical steroids can be used for some days, but if the allergic reactions persist, then their use must be stopped at once, and an immediate consultation with the doctor must be made. Because of the changes in the immune system due to the use of topical steroids, the skin will not be able to fight bacterial and fungal infection. That is, if you get itchy skin going forward, and to get relief, you apply topical steroids, then that itchy feeling will sometimes even become worse and cause reddish areas. Topical steroids are known to be very potent medications. They are classified according to their strengths. That is, Class 1 medications are the most potent, and Class 5 topical steroids are the least potent. These will be used in different ways by doctors to maximize their benefits and minimize their side effects. Some doctors may begin with high doses, tapering to lower doses after several days.